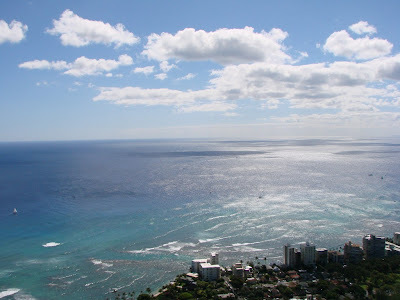 Here is a nice view of the Pacific Ocean taken from the summit of the Diamond Head trail. On this day the water looks so calm and the sky so blue with nice fluffy clouds. On a clear day you can see hundred of miles out into the ocean and if the conditions are right and you are looking at the right place you may even see another island. 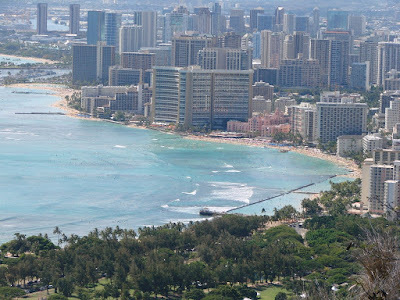 Here is a photo of Waikiki that I took from atop the Diamond Head hiking trail. On a good day the view from Diamond Head is the attraction that brings thousand of people up the short hike. For more about the Diamond Head hike see our series starting here. 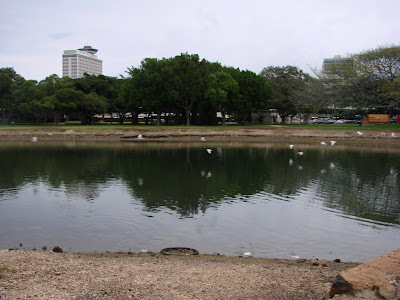 I took this shot one evening at Ala Moana Beach Park. I’ve always liked reflections in water and as a flock of birds flew by I was able to catch some of their reflections in the water. Watching bird effortlessly fly is always relaxing to me.. unless they are flying directly at or over me.